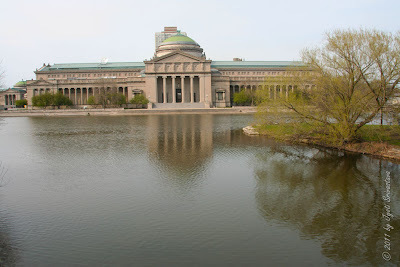 Museum of Science and Industry.. 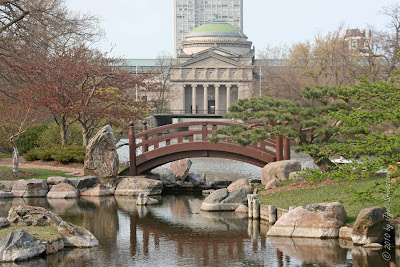 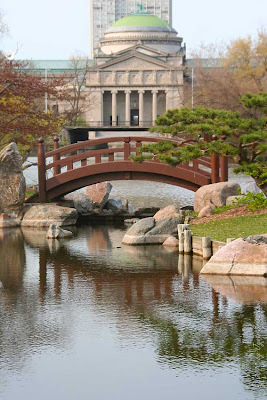 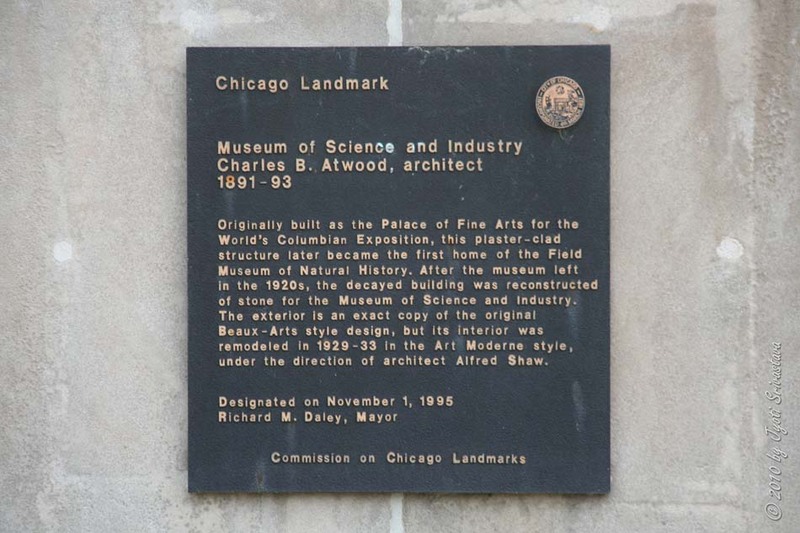 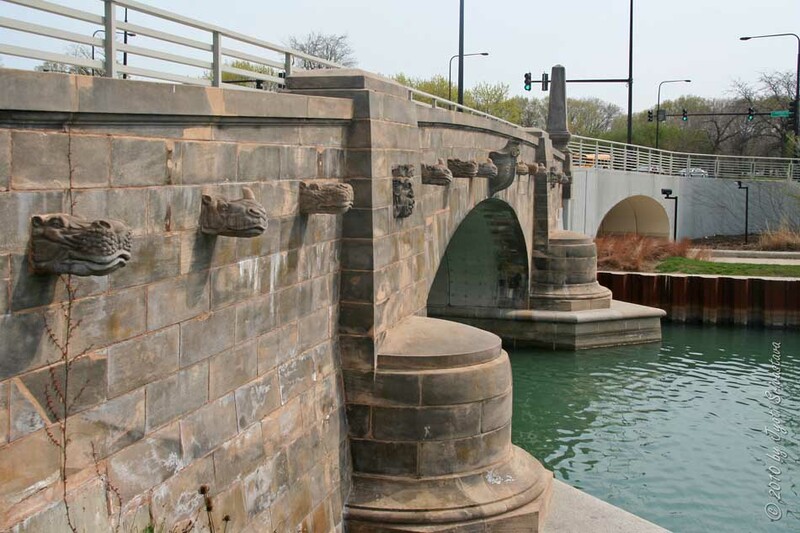 Date Designated a Chicago Landmark: November 1, 1995.. 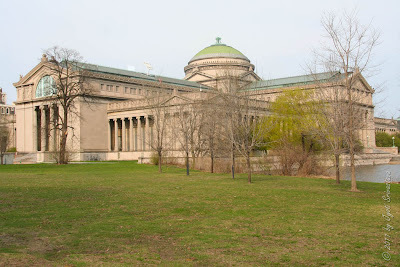 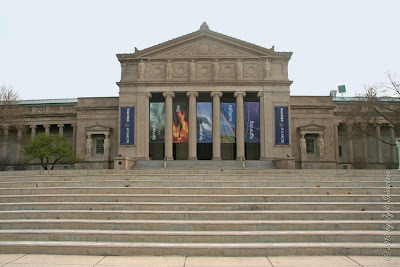 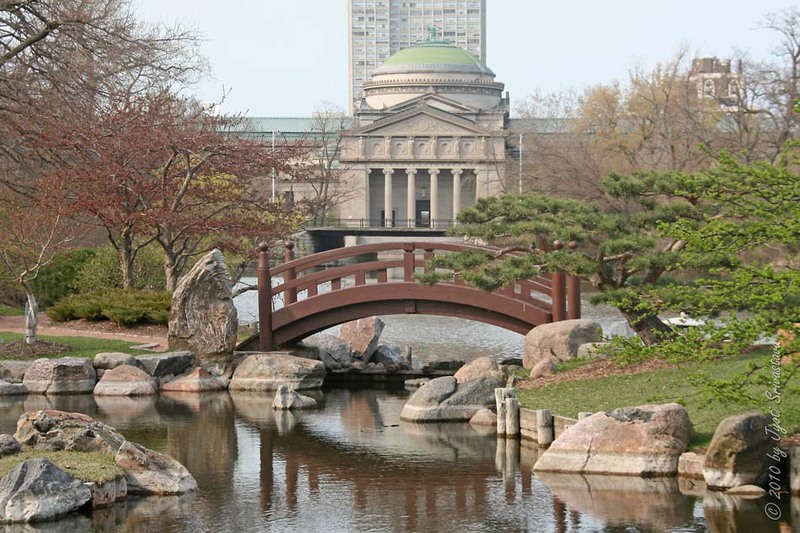 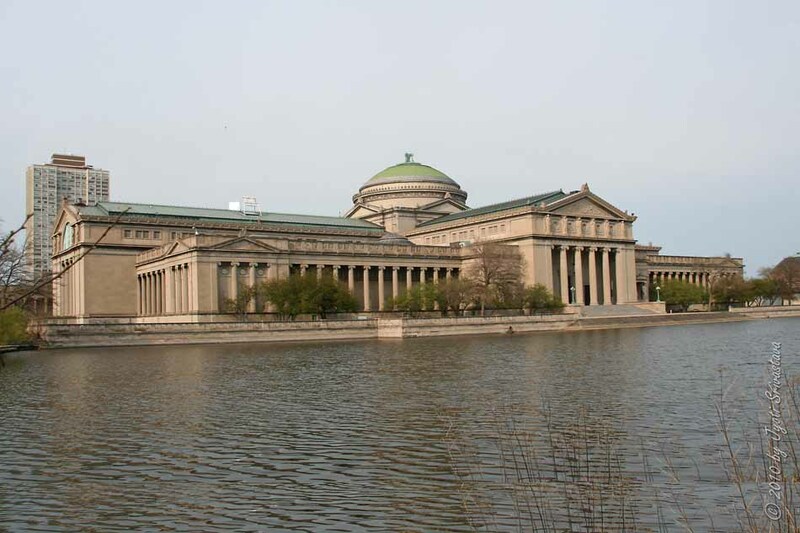 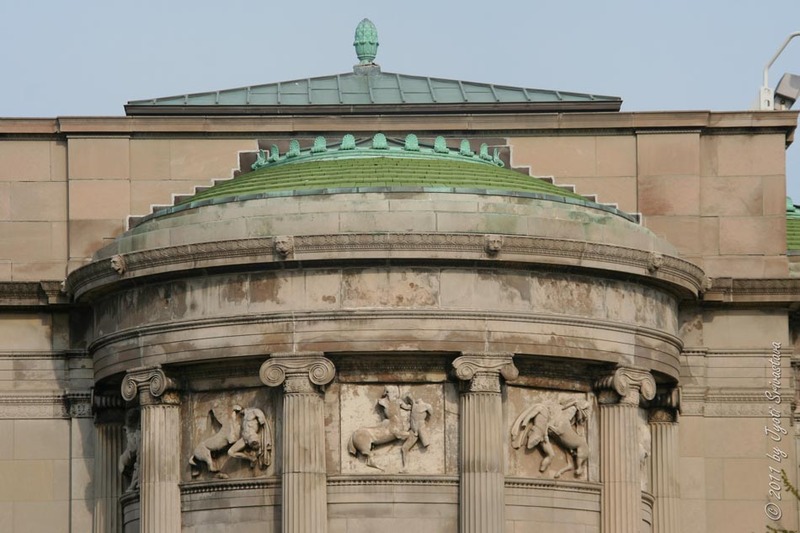 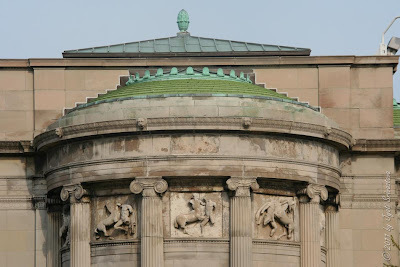 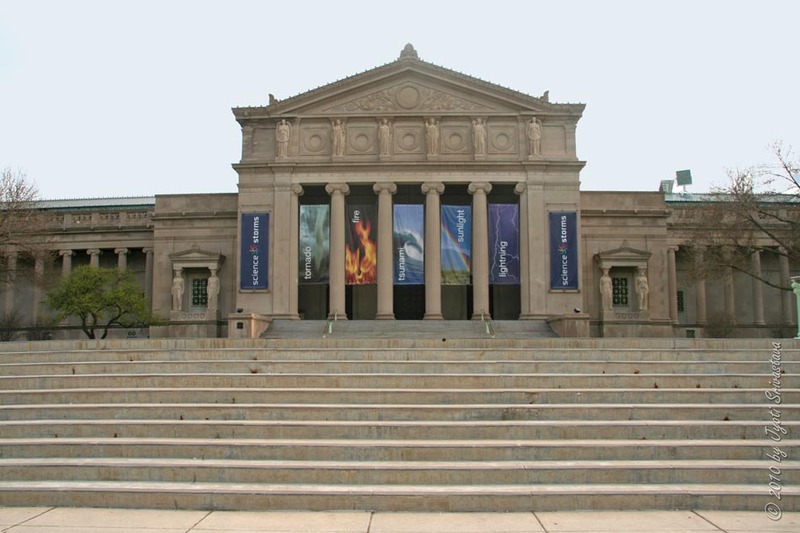 Originally built as the Palace for Fine Arts for the World's Columbian Exposition, this plaster-clad structure later became the first home of the Field Museum of Natural History. After the museum left in the 1920's, the decayed building was reconstructed of stone for the Museum of Science and Industry. 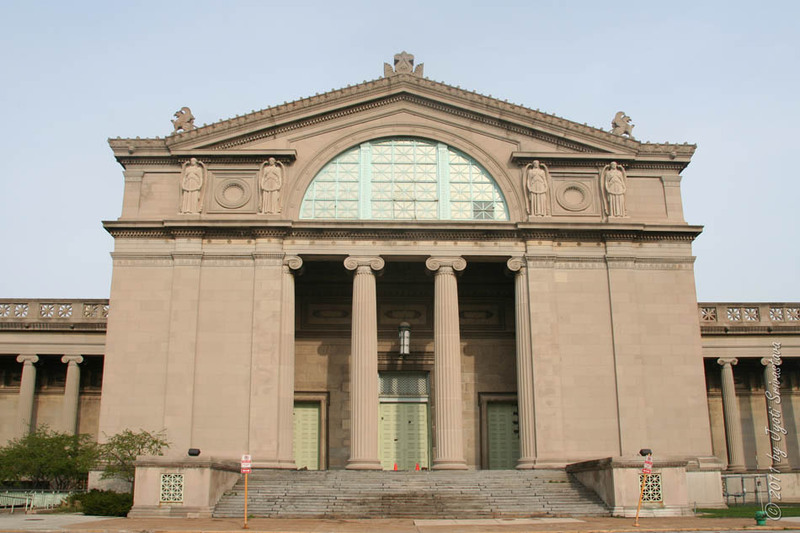 The exterior is an exact cop of the original Beaux-Arts style design, but it's interiors was remodeled in 1929-33 in the Art Moderne style, under the direction of architect Alfred Shaw. 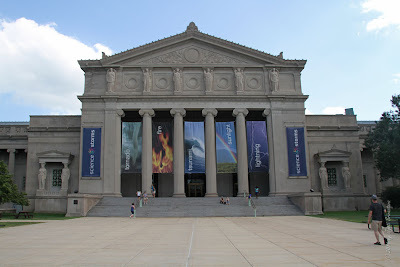 Designated on November 1, 1995.. 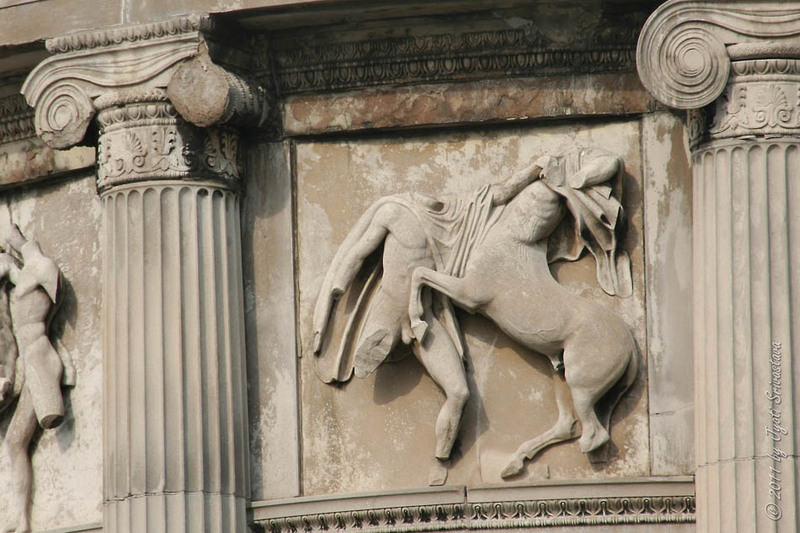 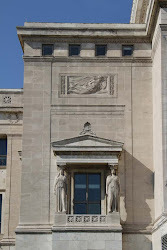 This post is only on the architecural sculptural details on the facade, and not on the exhibits in the museum.. 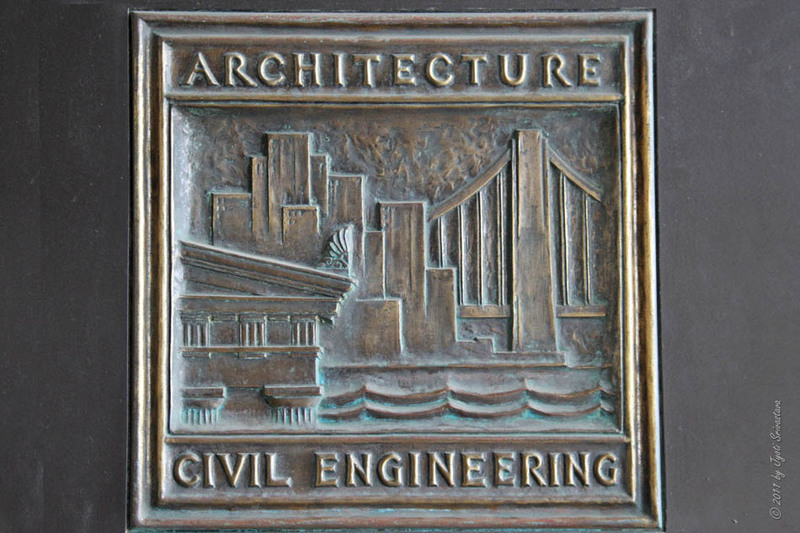 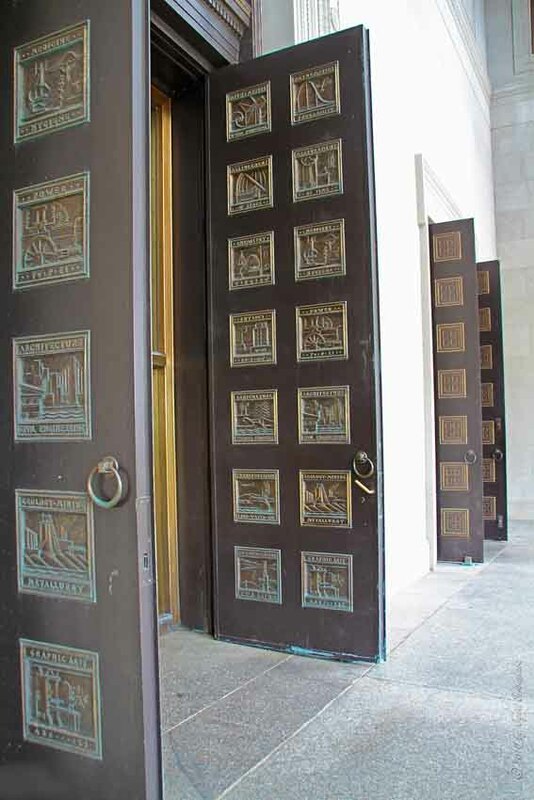 The North entrance [main entrance] has amazing bronze doors.. The large bronze door at the museum North entrance, represent fourteen important subjects in science, including mathematics, engineering, medicine, transportation and architecture..
For more images of the bronze doors, click here..
Rear view of the museum..
West entrance of the museum..
West wall details, by Philip Martiny..
Also for more on Philip Martiny, read Gregory H. Jenkins incredible blog, click here..
South entrance of the museum..
Caryatids columns on a porch..
Perhaps the best view of the museum is from the Osaka Japanese Garden, in the south..
Museum of S&I: II [Caryatids]..
Museum of S&I: III [Wall details]..
Museum of S&I: IV [Bronze Doors].. 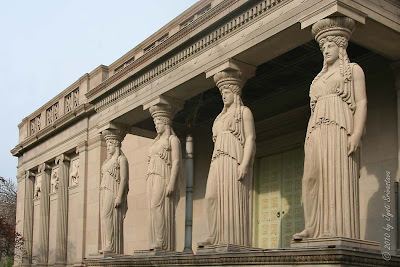 Statue of The Republic - by Daniel Chester French.. 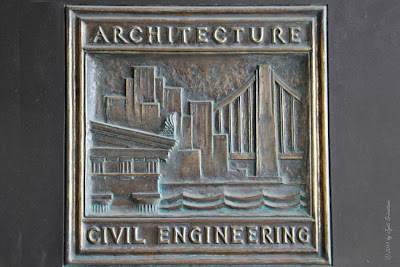 Many thanks for taking this possiblity to speak about this, I am strongly over it and I reap the benefits of studying this subject. 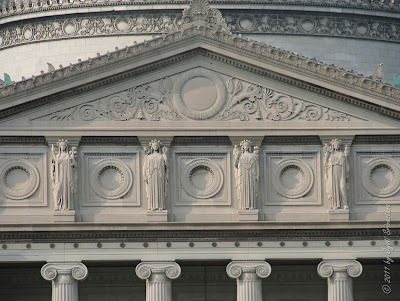 When possible, when you gain data, please update this blog with new information. 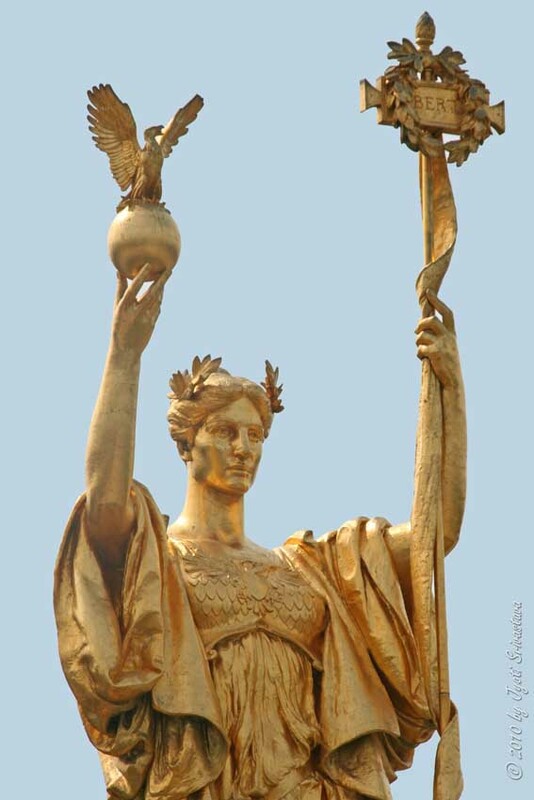 I’ve discovered it extremely useful.